Many organizations suffer from perceived fairness issues based on how various departments and team members perceive work performed by other departments or individuals. Each of us has a built-in scale where we weigh and measure the amount of effort and contribution we give to the organization in exchange for our compensation and how we view the performance of others. The challenge is that we all see the world around us differently, based on our frame of reference or perception. Frame of reference is created from our personal experiences; how we were raised; and our teachers, parents, and other life events. Quite often, two people can look at the same situation and see two completely different pictures based on their perception. Work environments are further complicated in that employees may not have all the information or understand the complications of a particular situation. We base our perceptions on what we think we see, when in reality there may be a lot more to the situation. For example, in the above story, the office team is not aware that the production staff worked all night on an off-site job , grabbed a couple hours of sleep before coming into the office for more materials, and then left at 2:00 PM to go back to work the off-site job. Employees and departments sometimes create their own stress and feelings of unfairness by forming opinions on partial information or misperceptions, then allowing it to negatively impact them at work. Employees also often don’t understand that information about other employees sometimes cannot be shared. 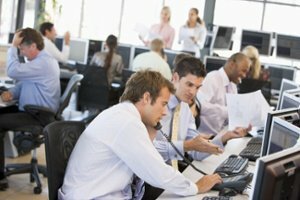 From the employees’ perspective, they may think management is not doing their job holding individuals accountable when in reality, there are other issues at hand such as a disability, death in the family, FMLA, medical challenges, or the fact that the corrective action has been taken with a particular employee. Management cannot talk about these confidential matters and simply need employees to trust that management has the company, team, and individuals’ best interests at hand. Provide more information and clarity upfront.In the above example, perhaps key leaders need to help the office team understand things from the production team’s perspective. Keep a pulse on attitudes and more.Conduct a regular opinion survey, ask employees how they feel, or pull together focus groups for input. Be approachable and open to criticism and feedback.Be accessible and non-defensive when approached with feedback. Encourage openness and transparency.Create a safe environment that allows employees to say what is on their mind and to discuss and resolve differences among themselves. Encourage a positive, supportive work environment.Reward and celebrate team work and cross-departmental team work. Give teams reasons to care and support each other. Stomp out negativity, backbiting, and nonproductive rumors.Keep aware of your environment and act quickly when these behaviors present themselves. It only takes one bad apple to bring the entire team down. Provide clear expectations.Make sure employees understand the purpose of their job, desired output and key performance indicators. Consider making this information available to all employees. Provide trainingon communication, perceptions, resolving misperceptions, and conflict resolution. Recognize, give praise and reward desired behaviors and results.This includes noticing employees who build up other team members and are supportive and positive. Know your job expectationsand do all you can to achieve them. Focus on your priorities and responsibilities to the business and let other team members do the same. Ask questions or get the facts.If you have questions about someone else’s job, ask them or someone in management. Never make assumptions until you have all sides of a story. Trust management and team members. Give management and team members the benefit of the doubt. Don’t assume the negative if you don’t have all of the facts. Most people are doing their best. Give praise and recognition to other team members. Look for opportunities to catch each other doing things right. Look for the positive.We tend to see what we are looking for at work and life. Always complain up, never down or sideways.Voice your opinion directly with the source or your supervisor. Speaking negatively about other team members or management only hurts you and does not help your work environment. Never engage in talking behind someone’s back, name calling, or in any way tearing down a team member. If there are concerns, make them known and get the facts. There are many times when management needs things to be brought to their attention so they can get them resolved. Other times, it may just be a misperception where you do not have all of the facts. Employees are encouraged to be open and respectful with each other and their employers to help make their work and team better. “What about them?”, becomes “What about us?” when we work together to create and nurture a great place to work.